I am a mountain lover. I love to snowboard, rockclimb, hike, kayak, and pretty much do every type of exploring I can. I spent my childhood traveling to every National Park in the western United States with my family. I always said one day I would end up out there. Then I turned 18, went to college in Miami, Florida (aka. the flattest city on planet earth) and moved to Nashville, Tennessee. One year later, I am still in Nashville… and I LOVE it. There may not be any snow capped peaks or red rock canyons, but there are so many hidden gems in the Southeast. A lot of them you only need a day to visit from Nashville. If you want to go on an adventure that starts with waking up in your bed, and end with going to sleep in your bed you’ve come to the right place. This post outlines my personal favorite day trips from Nashville. Click here for a complete list of all Tennessee State Parks. Rock island is beautiful year round, and about 1.5 hours away from Nashville. The best waterfalls to visit are Great Falls, and Twin Falls. Once you enter the park and pass the visitor center, drive about a mile up and Great Falls will be on your left. The entrance to the parking area is located in front of a brick building. You can take the trail down to the river/rocks. Once you get there you can explore around, and walk upstream to get closer to Great Falls. In the summer you can even swim up close and under the falls. To get to Twin Falls, continue down Great Falls Rd, take a left on Rock Island Rd, and another left on Power House Road. Take that road until it dead ends and you’re there! This area is a 2hr drive from Nashville. The two waterfalls are Fall Creek Falls and Cane Creek Falls. You can see both of them on a 2.2 mile loop trail that starts at a parking area on the Scenic Loop Road. I’d suggest stopping into the visitor center when you get there to grab some more information and a map. This is a more moderate hiking adventure and it is only 45 minutes from Nashville. There are almost 6 miles of scenic hiking trails, and the creek is beautiful. If you decide to turn you day trip into a weekend, there are almost 57 campsites. The Obed is one of my all time favorite spots in Tennessee. It is mostly for rock climbing, but there are swimming holes, beautiful overlooks, and a cool brewery called The Lillypad. Whether or not you climb, it is a spot that can be enjoyed by everyone. It is located about 2 hours down I40 E from Nashville. Take exit 320, turn left, and it is another 30 minutes down the road. Fun fact: this is where Kyle and I met climbing last year! I have only been to Greeter Falls in the winter when it was frozen, and I HIGHLY recommend that to anyone. It is pretty easy to access from the parking area and a moderate hike. This is by far the closest place to Nashville, located only about 30 minutes outside of the city. There are short hikes from the parking area to an overlook (pictured above - one of the best places ever to watch the sunrise), and canoe rentals available at Canoe Music City. In my opinion, Cummins Falls is the coolest waterfall in Tennessee, and it seems like everyone knows it. It will always be extremely crowded (especially on the weekends in the summer). I’m not a big fan of crowds, so I prefer to visit during the week or at sunrise on the weekends. I am not a big caver, but I added this to the list because it is just. that. cool. Neversink Pit is more of a big hole in the ground rather than a traditional cave. It is magnificent, but requires some knowledge of equipment. 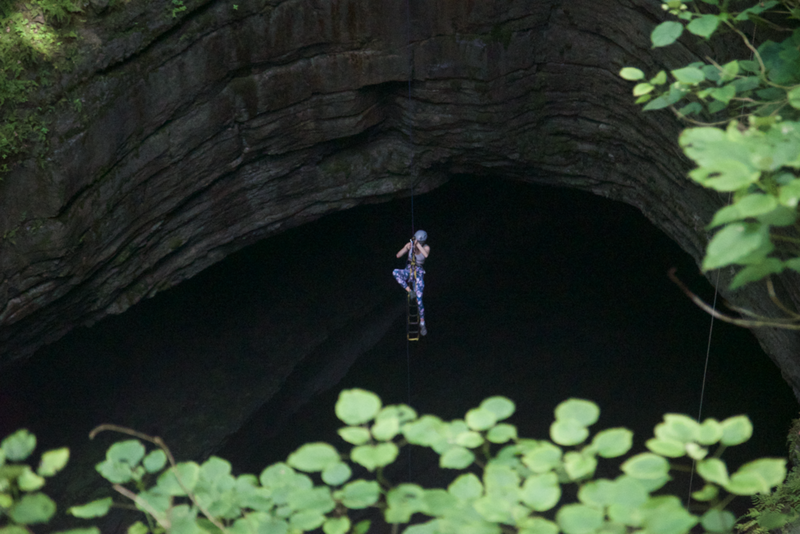 You must know how to set up a static line rappel, ascend a rope, and become a member of the Southeastern Cave Conservancy. It is totally worth it, but make sure you don’t visit without the necessary skills. I have never actually been to Stephens Gap, but I have heard it is amazing. I added it just in case you want to go caving, but don’t have all of the skills to rappel into the Neversink Pit. You still need an SCCi permit for this cave, but it is free and not too difficult to obtain. Go check it out and let me know your experience! Thank you so much for reading! Please feel free to leave a comment or contact me via email, or Instagram message with any further questions. Come visit my blog again next week for a list of my favorite weekend getaways.